Win and they're in MLS Cup for Roger Espinoza (left), Seth Sinovic (right foreground) and Sporting KC. 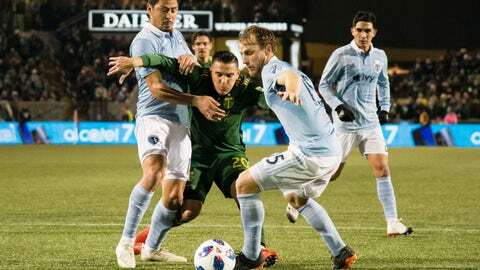 KANSAS CITY, Kan. — Sporting Kansas City and the Portland Timbers spent 90-plus minutes last Sunday in an exhausting, mentally taxing showdown that ultimately ended in a scoreless draw. Peter Vermes’ club also should be confident in that it has shut out the Timbers three times this season, meaning it may take just one goal on what could be a sloppy field to win the game. “Every team in the world would say playing at home is better than playing away in any sport,” said the Sporting KC manager, who had to relocate practice this week indoors after a blizzard swept through the region Sunday. Several inches of snow covered the field, but it should melt by Thursday night. Much like Portland, the stands are always packed when Sporting KC plays. That should also contribute to an intense, lively atmosphere for the second leg of the Western Conference finals. Sporting KC handled it well enough in Portland, and now it’s up to the Timbers to handle the road crowd in Kansas City.